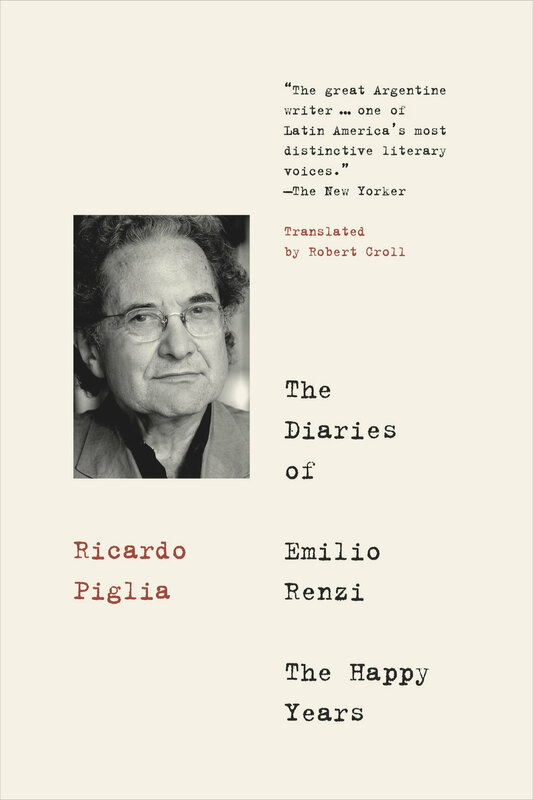 The second installment of Ricardo Piglia’s acclaimed autobiographical diaries, The Diaries of Emilio Renzi: The Happy Years continues the celebrated Argentine author’s bibliographic and intertextual record of his auto-fictional alter ego, Emilio Renzi. Piglia intimately interrogates the trajectories of Renzi’s literary, professional, and personal spheres against the backdrop of Argentina in the 1970s, rampant with emotional and political turmoil from displacement under the effects of Peronism, guerrilla warfare, and a bloody military coup. As in Formative Years, Piglia deftly weaves literary criticism with fiction in this second volume, taking on the historic traditions of literature within which he has secured a place of his own. Let us begin with the death of Perón. On Monday, after alternate versions, stories, enhancements. A meeting at home in the morning with Rubén and Boccardo, delusions with Sadovsky and other gentlemen who have discovered Lenin (what? Lenin?) because of his “prestigious names.” The melancholy while Perón lay dying, at least while the story of his death was born, which I kept myself away from until after four in the afternoon, when I left home and started to grow concerned about the lines in front of the shops (I thought: “I have oil,” I thought: “The lines are coming, just like in Chile”) and about the Galerna library being closed. In the bar I find out about the death of King Lear: general astonishment at my ignorance of the news that had moved everyone in the world. “Where were you?” etc. Even worse, I heard the news from Saúl Sosnowsky, a depoliticized escapee who lives in the United States, whom I am meeting to give him a chapter of my essay on Arlt for his magazine Hispamérica. The city is quiet, people piled up at Congreso, at nightfall, waiting for the line to begin so they can see the dead man. I visit David, furious about the telegram from the PCR with condolences for Isabelita. I get up at two in the afternoon. An unexpected appearance from Amanda, who comes with Anita Larronde (Luppi’s wife), bringing me a novel by Pavese that, according to her, I had lent her. Trivial conversation, no great tension, a pleasant ending: I give her a copy of Los Libros magazine. Ana says: “There’s an excellent article in here.” She looks for it, it’s mine, and she is amazed. “I’m going to tell Federico I’ve been around important people.” That’s what we call displacement, saying one thing in place of another. I move through the rainy city, the endless funeral lines, and no one seems to want the goodbyes to end, no one wants to go home; I remember wakes in my childhood that lasted all night and continued on after noon, but now they are expanded, crowded, with serious gestures that repeat on every street. Some have waited for thirty hours to see the dead man, the venerated man one last time. I walk through the empty city, street openings blocked off, people wandering with a sorrowful air, and I end up on Carlos Pellegrini, where (without seeing it) I feel the effects of the funeral procession that crosses Avenida de Mayo carrying the corpse. Men cry, I see a policeman with his face damp from weeping, the soldiers in procession cry as well. Sorrow weighs down upon the city like a shadow. The Montoneros sing out their slogans. I lose myself in the multitude and make it to Congreso. On the way back I pass down endless streets, skirting along a persistent row of men and women lined up to see the cadaver. The long procession continues along Carlos Pellegrini until Retiro. The people’s pain. I return home and observe the city in darkness from high above. The lines go on in spite of the rain. León R. comes over and makes history personal, saying: “What has this man done to us.” It isn’t a question, it’s a complaint, as though he were referring to the ghost of Hamlet’s father. León’s personal view refers everything to himself and his own feelings. That is his philosophical viewpoint. What does the world mean for me? More deep-seated and extreme than Descartes: the subject is the truth of reality. Perón’s death has erased all meaning, the despotic signifier has vanished; the mourning is endless and stories proliferate. I register some of them as I walk through the streets: “A regiment from La Tablada rose up” (they say on the first day). Or rather: Perón is dead, the officers make their return. Cámpora appears to be the only political figure from Peronism who has some backing and support. The right sees him as an enemy and wants him to disappear. And so, news has been circulating all day about an attempt on Cámpora’s life. Balbín is the only one who can unify the dominant classes: he is the lower-ranked, imaginary substitute for Perón. In front of the coffin in the incandescent chapel, the empty speeches went on until the Chinese man with round eyeglasses appeared, standing beside the dead man, and said, inspired with a high Latin rhetoric: “Today, an old adversary comes to say goodbye to a friend.” Everyone cried except for him; proud and serene, he spoke for the first time as an equal l to the Man (as my father and all of the Peronists called him during the Resistance years) who had defeated him and imprisoned him and humiliated him. I remembered the unmatched tone of Quevedo’s prose after the murder of Julius Caesar: “Marcus Brutus was a severe man, a man who reproached other’s vices with his own virtue, not with words. He had an eloquent silence, and his intellect keen.” Epic emotion lies in a man’s praise for the rival who has defeated him, or whom he has conquered. It takes the form of a challenge, transforming anger into admiration. The heartfelt requiem that the defeated man enunciates, now without hatred. All of the politicians and the whole of the public pointed to Balbín as the dead man’s heir. Julia calls me on the phone, I meet her at Tolón and immediately my peace leaves me. She has lost her handbag with her glasses in it—now she can’t see (does she know who I am? )—and her documents. She is broke, alone, and lost, and she weighs me down with everything. (She also fantasizes about getting together with David, who will be alone on Wednesday once Beba goes to Europe after a Chilean man.) Of course I have nothing to say to her, and I tell her as much and give her a thousand pesos to get back home… Oh those lost loves. It’s as though a light is going out. The woman we once loved is a stranger, speaking to us and chiding us as though she knew us. She seems crazy, talking nonsense. That is how I see her now; love makes people better and when it ends, oh, it is too late for tears. On the bus, a chain of associations, the criminal always tells his tale as though it belonged to someone else. He can kill, but he cannot say, “I have killed.” It works the same way as dreaming, where the intensity of the experience cannot be transmitted with words: in order to say it, the killer has to kill again. A grammatical reasoning behind the serial killer: he can only speak through the detached bodies. And who can read his message carved into the corpses, as words written in sand? He cannot say it and so repeats the act. I go to dinner with Iris at América. León calls after I come back, a melancholy encounter. He speaks from another planet: he analyzes Perón’s death solely through his perspective, as though Argentine history were part of his life. It is the left’s problem with Perón. He has stayed with the working class as though he had abducted them. That’s the issue with León and David. Peronism is seen as a scheme, a tyrannical means of using the subordinate classes through deceit and lies. The personalization of politics viewed as a psychological trap. What has this man done to me, he who governed the country for years and then died without having been condemned? Everything is experienced in first person. Politics as a private drama. That is the merit of impassioned thought and also its self-referential closure. A peaceful and happy day. I watch the World Cup finals on television: Germany-Netherlands. Soccer is like life, as my father would say: the better one never wins. Iris and I walk around the city, marked by the absence of the Man. Iris laughs, “he was always controlled by women. First Eva and then Isabelita. The best thing,” she adds, “is that he always got married to fallen women.” Cuarteleras, barracks girls, as military jargon calls the female soldiers who accompany men to war. Andrés comes over: his older son is dying of cancer. The whole succession of catastrophes, no work, his ex-wife living with Juan Gelman, his ex-best friend–he needs to move. Weighed down, at his limit, he raves a bit and I follow, raving along with him. “Is it possible to kill and not be caught?” We speak calmly, analyzing several alternatives. One could say I spent the whole day sleeping. I got up at ten, and Carlos came to visit me. I went to lunch at the tavern on Calle Serrano. I went back to sleep until three in the afternoon. Now I imagine I will go out into the street like a sleepwalker, looking for a woman. I receive a beautiful letter from Tristana. She announces a delivery of stones for the man with the golden arm. Once more the fantasies are reborn in a corner, what can I say to a woman (married, with two children) in a letter. A Stendhalian theme. I spend the day at Iris’s house, very good. We go out for dinner in the rain, under the pale lights. I listen to Mozart, make myself some tea and prepare to write “Los dos linages” in Borges. I act as copyist, going over and over the initial pages of the essay. Three pages that barely suggest the tone. An essay depends on the conviction transmitted by the prose. A feeling that I am bound to the barrenness of the times. I see David, who calls me to meet in La Moncloa. A meeting for Los Libros. We have Issue 36 ready. An excellent article on Althusser by Altamirano. Several articles about urbanism. What dangers disquiet me? More than dangers it is a discontentment, facing the inadequacy of my life. The essay could be called “Ideology and Fiction in Borges.” Meaning proliferates, the point is to reconstruct the fiction from the origin. The ways writers imagine the material conditions that make their work possible. Sometimes I can’t stand combinatorial analysis, I need some distance, so I go out to smoke a cigarette. The second installment of Argentine literary giant Ricardo Piglia’s acclaimed bibliophilic trilogy follows his alter ego, Emilio Renzi, as his literary career begins to take off in the tumultuous years 1968-1975—running a magazine, working as a publisher, and encountering the literary stars among whom he would soon take his place: Borges, Puig, Roa Bastos, Piñera.